The Rural Australian Medical Undergraduate Scholarship Scheme was first introduced in the year 2000. The aim of the Scheme is to assist students with a rural or remote background to complete a standard medical degree and provide them with support and mentoring from a rural doctor. A yearly competitive application process was used to allocate new scholarships. Criteria for receiving a scholarship include rural background, financial need and a commitment to future rural practice. After they are trained and registered, there is an expectation that RAMUS scholars will return to a rural or remote area. The RAMUS team has been undertaking a tracking project to determine to what degree this is occurring. As at 2016, 2,043 scholarship holders had graduated an Australian university medical course with the assistance of RAMUS with around 250 scholarship holders yet to graduate. The tracking project located 1,741 former scholarship holders and matched where they are now with their university attendance and where they came from – using their home address at the age of five. The project has used the Australian Standard Geographical Classification system (ASGC-RA) to map the locations of former scholars. This system has also been used to rank RAMUS applications since 2008. Prior to this the Rural Remote Metropolitan Areas (RRMA) classification was used. Former scholarship holders not included in the tracking study were those that we were unable to locate, those that were not registered as a medical professional and those that are practising internationally. 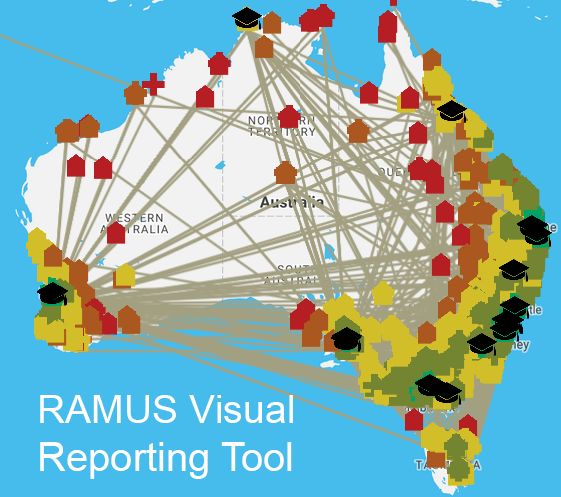 The RAMUS Tracking Project identified where applicants spent their childhood as a means of evaluating rural and remote life experience, with the criteria based on the perception that those from a rural and remote area would be more likely to return to these areas. The age at which the scholarship started evaluating rural and remote experience was five years of age. Figure 2 illustrates that twelve per cent (12%) of scholarships were awarded to applicants who had lived in a major city at the age of five years, with 47%, 32%, 7% and 2% of scholarships awarded to applicants who had lived in inner regional, outer regional, remote and very remote areas respectively (Figure 1). Addresses in ASGC-RA 1 skew the results as it is possible for an applicant to have lived in a metropolitan area at the age of five and still meet the criteria of rural background before commencing medical studies, and/or they may have amassed sufficient rural background experience to be awarded a scholarship. Scholarship holders studied at all of the Australian universities providing a standard medical course. There has been a significant change in the number of universities offering an undergraduate course since the scholarship started in 2000, with the majority of courses now graduate courses. This has resulted in a change to the type of students applying from undergraduate students moving away from home for the first time to graduate students who had been away studying for a number of years prior to commencing medical studies. The number of scholarship holders at each university varied depending on the scholars’ preferred study course. RAMUS did not have specific quotas to meet for each University. Universities located in regional areas tended to have greater success in producing rural practicing doctors, although a number of city based universities also achieved this. Table 2 list the number of scholarship holders that attended each university. Of the 1,741 past RAMUS scholars included in the study, 608 (35%) are currently practising in a rural, regional or remote (ASGC- RA 2-5) area (Table 4). 139 are working as General Practitioners, with 80 (58%) of these practising in a rural or remote Australian area. 261 are working as Specialists, with 58 (22%) of these working in a rural, regional or remote area. 373 (21%) are provisionally registered, with 146 (39%) of these working in a rural, regional or remote area. 968 (56%) are practising in Australia under a general registration, with 324 (33%) of these working in a rural, regional or remote area. Sixty former scholars are practising/training in the same postcode as their home address. Former scholarship holders have gone to many places and specialised in many fields of medical practice. Table 3 shows that 63% of former scholarship holders that became a General Practitioners are now practising in a rural or remote areas. The number of former scholarship holders with a specialisation practising in rural and remote areas is much lower at 19%. Figure 3 demonstrates that the universities located in regional areas have a greater number of former RAMUS graduates practising in a rural or remote area. The University of Tasmania (50%), James Cook University (58%) and the Flinders Northern Territory Medical Program (100%) are the only universities with 50% or more former RAMUS scholars practising in a rural or remote area. The following pie charts exhibit the correlation in ASGC-RA’s between where former scholarship holders were at the age of five and where they were practising medicine as at June 2016. Of the scholarship holders that were in a metropolitan area at the age of five, 72% remained in a metropolitan area following graduation." Of the scholarship holders that were in an inner regional area at the age of five, 70% were located in a metropolitan area after graduation, with 23%, 5% and 2% of graduates being located in remote and very remote areas respectively. Of the scholarship holders that were in an outer regional area at the age of five, 21% remained or returned to an outer regional location. Sixty per cent of graduates were located in metropolitan areas, 17% in inner regional areas, and 1% in both remote and very remote areas." Of the scholarship holders that were in a remote area at the age of five, 5% returned or remote to remote areas. More than half were located in metropolitan areas and one fifth were located in outer regional areas." Of the scholarship holders that were in a very remote area at the age of five, 9% returned or remained in a very remote area. Two thirds were located in metropolitan areas. With so many former scholarship holders currently completing their training and the transient nature of being a rural or remote medical practitioner we predict that the number of former scholarship holders practicing in rural and remote Australia will increase. The number of scholarship graduates is increasing as the scheme is ending. The annual scholar survey asks graduating scholars about their intentions to train and work in rural or remote areas in Australia. The results indicate that graduating scholars have high intentions to train in a rural area (70%) and to work in a rural area (88%). When asked if their interest in working in a rural area has changed since coming their medical studies, 64% responded with an increased interest, 33% had about the same amount of interest and 3% reported that their intention to work in a rural area had decreased. Often commented in the surveys were the reasons why the graduating scholarship holders were looking forward to practising in a rural area. These reasons were often due to family ties, a familiarity with an area and the confidence they had gained through the experiences RAMUS had afforded them throughout their studies. The tracking data will be updated in 2018.